For almost two years I have written about insulin, and insulin pumps, and infusion sets, and cartridges, and canulas, etc., etc.. But I’ve never really gone into much detail as to how all those components come together to keep me kicking. So, today, I give you a step-by-step photo guide into infusion day, which generally occurs every three days. Alcohol swab, check. 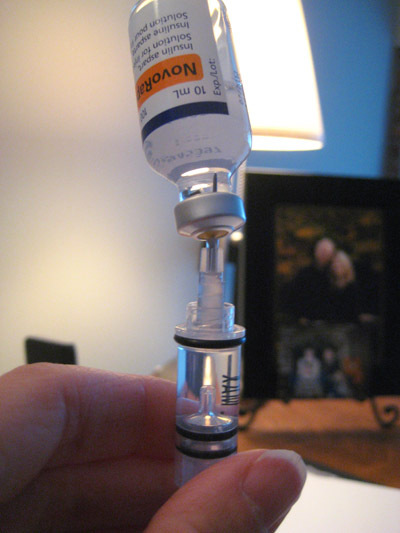 Fast-acting insulin, check. Cartridge (also called reservoir), check. 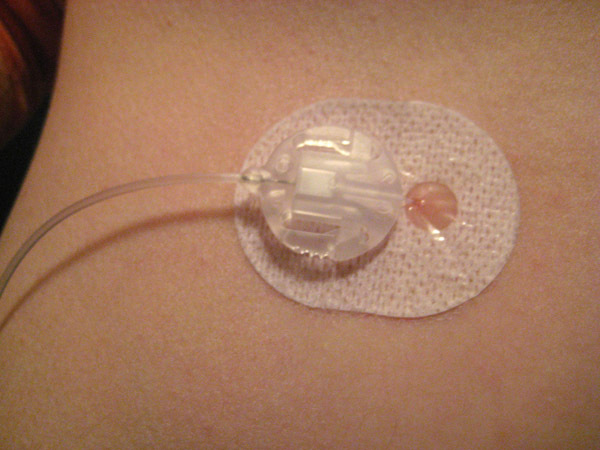 Infusion set/canula, check. 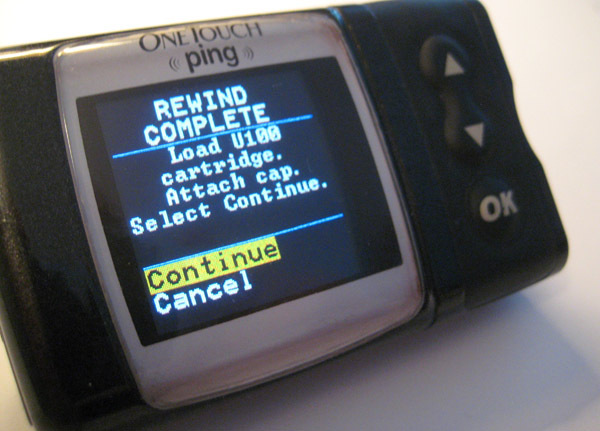 Tubing, check… Oh yeah, and you sort of need the insulin pump too! Step 2: Avoiding hepatitis and other such germies. 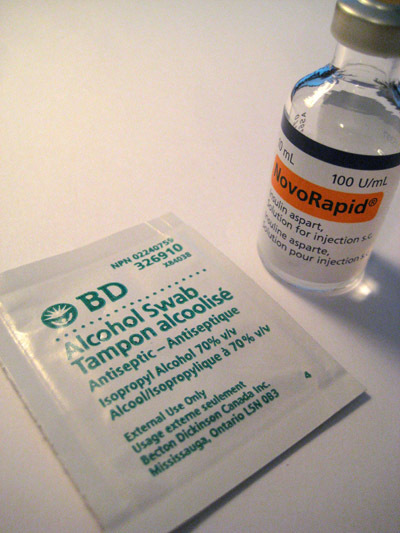 Swab top of vial with alcohol. Swab site location (skin) with alcohol. Draw out the amount of units required for 3 days. I usually fill the cartridge with 140 units, 15 of which somehow disappear during the whole process, and then I generally have about 35-40 units left over when I change out the infusion. Make sure to tap out visible air bubbles; I use a pen. Step. 4: Assembling the puzzle pieces. Step 5: Pumpin’ with the pump. Alright so there’s 4 steps to be followed with the pump. First you rewind the pump so that the filled cartridge can fit inside. Once it’s rewound, you load the pump with the cartridge. (That’s what’s going on in the picture.) Then you prime the pump, which is basically holding down a button until you see units of insulin squirting out the top of the tubing. The fourth and final step happens later. Step 6: Like a pin cushion. That there is the infusion, which in simple terms is the biggest freaking needle EVER! I’ve been injecting needles for 24 years, and while I’ve never really been a huge fan of it, it never really bugged me to do it. But switching over to the pump, almost 2 years ago, I still have problems watching that sucker going in – it’s freaking huge! Once the needle is all the way in, there’s two clicky things on the side that you squeeze to pull the needle out. 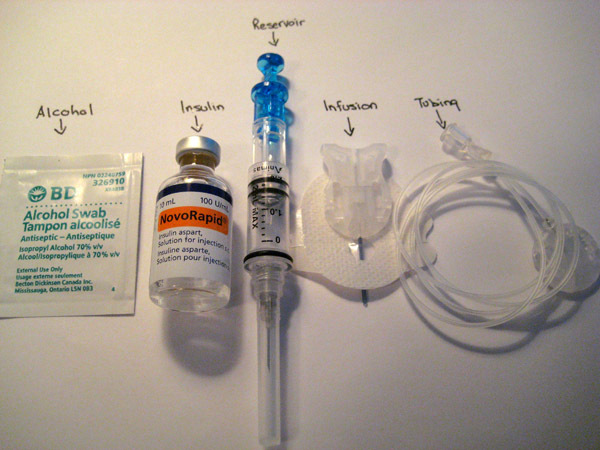 What stays under the skin is the cannula, which is a small, flexible tube of which the insulin goes through. Take the adhesive backing off infusion and stick to skin. 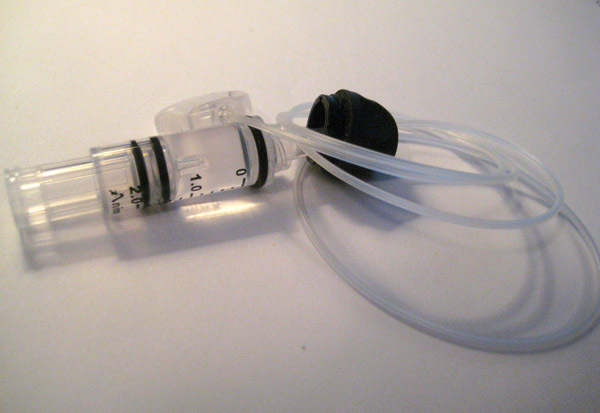 At this point, the final step of the pump, filling the cannula, can be completed. What this does is ensure that there’s a load of insulin (0.70 units for me) already ready to go in the cannula so that when you need it, it’s there. If I didn’t fill the cannula, it could take a good amount of time for the insulin to make it to my body, which means, I’m going without insulin, which could be disastrous. ALWAYS FILL THE CANNULA! Once all that’s done, we’re good to go. In other news… You know how yesterday I mentioned my love for Zooey Deschanel’s new comedy The New Girl. Well, I watched Monday night’s episdoe (the second episode in a row where I was snorting, like food coming out of my nose snorting, it was so hilarious) and right off the top, they were making fun of this DJ guy who has diabetes and his name was – wait for it – DJ Dia-beat-it! This entry was posted in Diabetes and tagged DJ Dia-beat-it, Insulin pump, step-by-step guide on inserting infusion, The New Girl, Type 1 diabetes, Zooey Deschanel. Bookmark the permalink. that was a pretty good info session on site change day. Lovely pictures (as always) and so good at explaining it. We both use novorapid! seems most the Dworld uses humalog. I had no idea of the procedure. It’s always been a question in my mind, but well, too polite to ask. It also makes me feel very sad for all the people, especially little kids, who are being diagnosed. 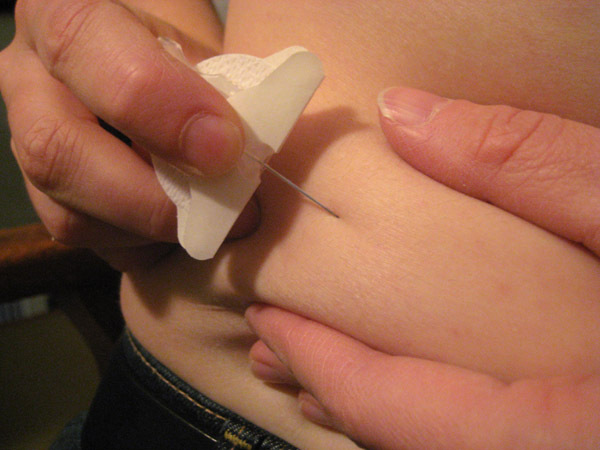 Diabetes is epidemic in New York City, and it seems to be largely diet-induced. It makes me want to eat healthier. So instead of walking over the bridge from the truck stop in Ontario, California to the In-N-Out burger joint, will just go for the walk. Yeah, the type 2 epidemic in kids right now is so bloody infuriating because it can be prevented with more education and proper care. Thank you for this blog. I was also too polite to ask and now thanks to this blog I know what you have to go through. As for New Girl…I love that show.